She certainly would, but if he thinks this is the first time real life has imitated Ayn Rand’s fiction, he needs to be paying a little more attention. Atlas has been shrugging for a long, long time. Let’s begin by looking at the case of net neutrality. The Washington Post‘s economics columnist, Robert Samuelson, makes it easier for us by comparing net neutrality to—you guessed it—regulations on railroads. As a young reporter in the 1970s, I covered the Interstate Commerce Commission (ICC). Created in 1887, the ICC regulated the nation’s railroads and sought to protect the public against abusive freight rates. Congress deregulated the railroads in 1980 and ultimately abolished the ICC. The verdict was that the agency had so weakened the industry that a government takeover might be necessary. Deregulation was a desperate alternative to nationalization. I mention all this because there are obvious parallels between the Internet today and the railroads in the late 19th century. Like the railroads then, the Internet today is the great enabling technology of the age. Like the railroads then, Internet companies inspire awe and dread. And now there’s another parallel: the resort to regulation. The result, for the railroads, was their slow decline, culminating in the nationalization of passenger rail (which plays such an important role in Atlas Shrugged) under the aegis of Amtrak, that paragon of efficiency that manages to lose money selling overpriced hamburgers to a captive market. Amtrak was formed—under an official name torn from the pages of Atlas Shrugged, the National Railroad Passenger Corporation—in 1971, 14 years after the novel was published. Net neutrality is meant to serve the interests of companies that are heavily reliant on large amounts of bandwidth, such as the Netflix video-streaming service, by giving them equal access to high download speeds at no extra charge. Net neutrality bears some relationship to the Fair Share Law, under which Hank Rearden’s production of his new metal alloy has been restricted at the same time that every manufacturer has been told they have a right to an equal share of it. This means that the highest-value, highest-volume users, the ones for whom access to large quantities of high-performance metal is vital—such as Ken Danagger’s coal mines—are required to wait in line behind those who are making golf clubs and coffee pots. But the perverse rate regulations of net neutrality most resemble the Railroad Unification Plan and the Steel Unification Plan. These are the plans offered by government regulators in an attempt to prop up weak, government-connected businesses. They consist of creating industry-wide “pools” in which all railroad revenues are collected, then shared out equally based on the amount of track each company has to maintain. The details aren’t the same, but the intent is: to collectivize the cost of infrastructure by deliberately divorcing the expense of the service from the actual amount you use it. In the case of net neutrality, this is an obvious bit of cronyism that is intended to serve the interests of one faction—the faction that has won the political battle for the moment—at the expense of everyone else. It is meant to serve the interests of companies that are heavily reliant on large amounts of bandwidth, such as the Netflix video-streaming service, by giving them equal access to high download speeds at no extra charge. Like many of Jim Taggart’s machinations on behalf of his company, you can see how this will actually be detrimental to firms like Netflix over the long run. A big Internet service provider like Comcast will have much greater incentive to build extra infrastructure to provide for the needs of a client like Netflix, if they can charge extra for it. If they can’t charge extra—if they are banned from charging extra—then they have less incentive and fewer resources to build infrastructure. In essence, this is a plan to slow down or even halt the construction of new Internet infrastructure. This is another parallel to Atlas Shrugged. There is a widespread simplistic conception that Ayn Rand was indiscriminately in favor of “big business.” But about half of the novel’s villains are big businessmen who are seeking special favors from government. The whole set-up of the first hundred pages of the novel is a series of backroom deals brokered among politically connected industrialists who arrange to use government power to squash their rivals and promote their own firms. And these machinations all come crashing down when they backfire on the favor-seeking firms—as we can expect to happen with net neutrality. So this is an open-ended claim of government power that can be extended without limit in the future. And that’s the final parallel in this case: Net neutrality has been imposed by decree. Recall the scene in Atlas Shrugged when the first wave of regulations are passed to strangle the economic renaissance in Colorado. Except that in this case, the power to issue directives wasn’t granted last month: it was granted in 1934, with the creation of the FCC. As I said at the beginning, though, the parallels don’t end with net neutrality. 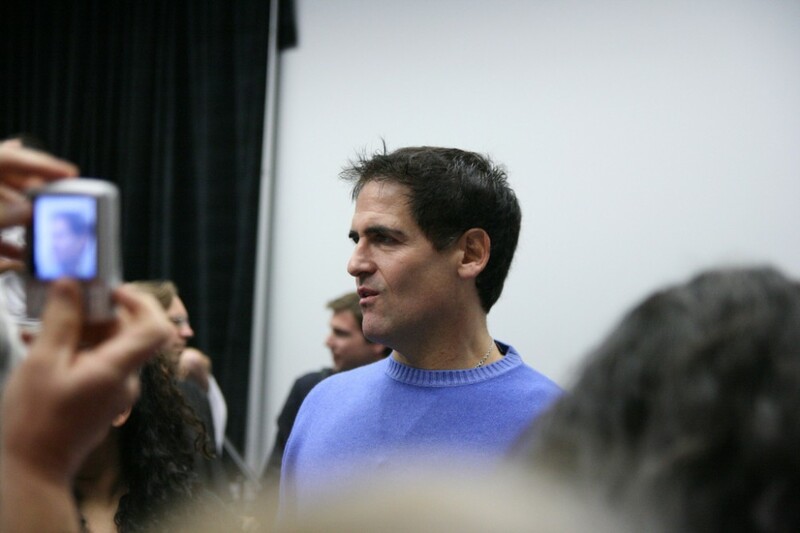 Did Mark Cuban say that Ayn Rand would write today about the Internet but not industry? I disagree. Ayn Rand wrote in Atlas Shrugged about the destruction of an American oil industry that was booming as a result of new technological advances. One of those advances was: fracking. No, really. Oilman Ellis Wyatt tells Dagny Taggart about his latest idea. How many years ago was it that they gave up trying to get oil from shale, because it was too expensive? Well, wait till you see the process I’ve developed. It will be the cheapest oil ever to splash in their faces, and an unlimited supply of it, an untapped supply that will make the biggest oil pool look like a mud puddle. Today’s fracking is not producing the cheapest oil—not yet, at least—but it has become affordable enough to tap enormous new supplies of domestic oil and natural gas. Ayn Rand even anticipated the arguments for banning fracking—but in a different form, with slightly different motivations. In her novel, the oil-fueled boom is shut down by a set of strangling regulations and taxes. But she anticipated the present-day attacks on fracking in her description of the smear campaign against Rearden Metal, a new alloy that is stronger and lighter than steel. (Sort of like this one, but cheaper.) Government scientists working for the State Science Institute whip up a hysteria based on invented concerns about the metal’s safety. Here is how they present their claims. Anyone who has followed the fracking debate will recognize the pattern. Maybe fracking contaminates ground water. Maybe it causes earthquakes. It’s all “maybe” and “somehow.” So we’re supposed to shut it all down and wait for further study—which will never be completed. Ayn Rand did identify a wider pattern that takes many different forms: any big, runaway success that pops up eventually gets shut down. More widely, the attack on Rearden Metal captures the basic method of the “precautionary principle,” in which environmentalists need merely to imagine a possible negative outcome and all progress is to be halted until the imagined danger is proven not to exist. It is an all-purpose restraining order against technological and industrial progress. Atlas Shrugged does not quite anticipate the openly anti-industrial hippies or the modern environmentalists. There is only a glancing reference to the austerity-worshipping Eastern mysticism of the “soybean cult” run by Ma Chalmers. I don’t think this is because Ayn Rand couldn’t imagine this kind of “back to nature” commune—it’s a cultural fad that dates to the 19th century, including in Russia, and she was certainly aware of it—but rather because it was incidental the themes she wanted to focus on. But she did identify a wider pattern that takes many different forms: any big, runaway success that pops up eventually gets shut down. In both Atlas Shrugged and in real life, there is a new economic boom in a Western state that happens because there is little or no regulation. In the book, it’s Colorado, it’s industrial, and it happens because “They don’t even have a modern government…. It does nothing—outside of keeping law courts and a police department.” (This was a quite believable description of Colorado—in 1957.) Today, the boom is happening in unenlightened states like North Dakota, the epicenter of the shale boom. Or it’s in California, which regulates heavy industry to death but has up to now left the Internet virtually uncontrolled. So clearly all of that has to stop. That’s the other big lesson of Atlas Shrugged: faced with rising prosperity created by uncontrolled businesses, some people would rather have the controls than the prosperity. We can tick off a series of other recent parallels to the novel. No such discussion would be complete, for example, without a mention of the massive bailouts handed out to politically connected business during the financial crisis of 2008, a parallel so strong it set off a boom in the novel’s sales. Superficial readers who just see Ayn Rand as being in favor of big business and people with money were confused by this, but actual fans of the book immediately saw the connection: the bailouts were completely in the spirit of Atlas Shrugged‘s dystopia, with government leaping to provide our money to support its cronies, from Goldman Sachs to the United Auto Workers (by way of Chrysler and GM). Government creates massive new programs which produce the total opposite of their claimed effect. Then there is the way the government creates massive new programs which produce the total opposite of their claimed effect. One of the characteristic quirks of the villains in Atlas Shrugged is the way they think they can guarantee a positive outcome and broad public acceptance for every new control if only they can give it the right name: the “Fair Share Law,” the “Equalization of Opportunity Bill,” and so on. In the real world, we get things like the “Affordable Care Act,” which leads to cancelled health insurance policies and skyrocketing premiums—that is, unaffordable care. Or there is the general method of rule by decree and the ubiquitous use of suspensions and special exceptions based on political pull—mirrored in the real world by the numerous exemptions granted to businesses allowing them to bend the requirements of the Affordable Care Act, or the ad hoc reinterpretations required to prevent the law from collapsing. As of this writing, for example, the Supreme Court is considering a case, King v. Burwell, in which the government is arguing against enforcing the Affordable Care Act as it was written. Spoiler alert: that particular scene doesn’t end well. “You change the political power, and the white business owners just move outside the city. So you have power over a doughnut hole. We need help to climb out of the doughnut hole,” he said. He went on to describe a plan in which the government would intervene to stop people from relocating their businesses. “It’s the only way,” Jackson said. Or there is the guaranteed minimum income, a proposal to put everyone on the dole, which has been regaining support in recent years. This is, of course, a page taken right out of the story in Atlas Shrugged about the utopian socialist scheme that destroys the 20th Century Motor Company. I point out elsewhere that the name of the firm is almost allegorical: it’s a metaphor for the 20th century’s experiments with socialism. But as with everything in the novel, it is prophetic because it is based on things that had already happened in the past. In fact, the 20th Century Motor Company sounds most like an episode from the 19th century, when little utopian communities sprung up around Europe and North America seeking to take the new productive power of capitalism and make it serve a collectivist ideal. For example, British industrialist Robert Owen poured a fortune into the utopian community of New Harmony, Indiana, which went through the exact cycle recapitulated in Atlas Shrugged, collapsing amidst some rather unharmonious recriminations in which the whole disaster was blamed on too much individualism. In fact, the Owenites are credited with inventing the term “individualism,” as a pejorative. This highlights the reason Atlas Shrugged has proven to be so prophetic. In “Is Atlas Shrugging?” Ayn Rand described the method by which she invented the government controls in her fiction: “In my novel, I presented these issues in terms of abstractions which expressed the essence of government controls and of statist legislation at any time in any country.” Remember Ayn Rand’s view of abstractions as being based on and induced from real, observed concretes. Her novels seem so universal in their application to real events precisely because she projected the legislation and decrees and government controls by abstracting the overarching principles from real events—which is why those abstracted versions are likely to be relevant to new concrete political events as they arise. But for all of these parallels to current events, we can consider ourselves lucky. For reasons I have explored elsewhere, we have not gone all the way down the road toward dictatorship that Ayn Rand projects in Atlas Shrugged. But there are other parts of the world that have gone much farther, where real life is stranger than her fiction. The most interesting parallel today is Venezuela. In 2003, the country’s entire productive middle class, particularly workers at the state-run oil company, went on strike in an attempt to stop Hugo Chavez from imposing a socialist dictatorship. Remember that Ayn Rand’s original working title for Atlas Shrugged was The Strike. So whether they realized it or not, the people of Venezuela took the central plot idea of her novel and put it into practice. Unfortunately, the events were not parallel enough. Venezuela’s strike failed, the Chavista dictatorship was entrenched, and now, twelve years later—coincidentally or not, the exact span of Galt’s strike in the novel—Venezuela is now living through the kind of chaotic economic death throes portrayed toward the end of the novel. Thus, Venezuela has become the only OPEC nation in which there is no gasoline at the corner filling station. And a country that had once been one of the wealthiest in Latin America is now suffering shortages of basic goods, from food to toilet paper. So how is the regime dealing with this crisis? Exactly the way the most vicious of the villains in Atlas Shrugged would deal with it. Venezuelan President Nicolas Maduro ordered the arrest of executives of one of the country’s largest pharmacy chains for allegedly creating shortages of everything from diapers to heart medicine. But it didn’t work out that way. Soon, the lines for $20 bills were matched by lines at every store that sold foreign goods. Since nobody saw much point in buying anything abroad to sell for just $2, people mostly pocketed the twenties and the imports never showed up on store shelves. And if any item did hit the shelves, whether it was a $2 box of diapers or a $2 sack of flour, it could be sold for $6 on the black market—so standing in line at the shops became a job. Riot police officers roamed the queues sniffing out dissent; subjects were recruited as spies. “It must be a conspiracy! A foreign plot to overthrow the monarchy,” raged the king. If this fable strikes you as far-fetched, spare a thought for the people of Venezuela. For 12 years, their economy has been run pretty much along these lines. I would not put a passage of that kind into the mouth of a character in the most exaggerated farce-satire—I would consider it too absurdly grotesque—and yet this is said, heard, and discussed seriously in an allegedly civilized society. That’s the ominous implication of the real-life parallels to Atlas Shrugged. If the novel were a cartoonish exaggeration, as its critics imagine, that would be comforting; it would imply that we don’t really have to worry about living through the social, political, and economic collapse that it warns about. But events in the real world remind us that the collapse is real, that the principles that drive the events in the novel are driving actual legislation and regulation—events as modern and up-to-date as the imposition of Net Neutrality on the digital economy—and a country that goes farther down this road can match everything that happens in Atlas Shrugged. And go beyond it. Which makes the novel worth studying now more than ever. If, as Ayn Rand said, the purpose of Atlas Shrugged was “to prevent itself from becoming prophetic,” we had better understand the principles the drive the events in it, so that we can understand how to stop Atlas from shrugging.